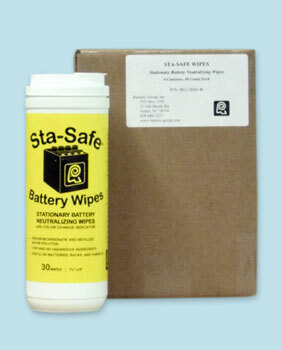 Moistened Wipe to neutralize and remove surface debris from stationary batteries. Color indicating to identify acid hazard. Soda bicarbonate and distilled water solution is non-hazardous. 30 wipes, 7½’ x 9’ in sealed canister. Sodium bicarbonate and distilled water solution. 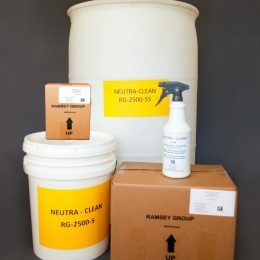 Wipes avoid overspray of trigger sprayer and resulting chemical residue when dry. Also effective on racks & trays as well as drips from post seals. Can be stored in ambients below freezing without liquid spill. 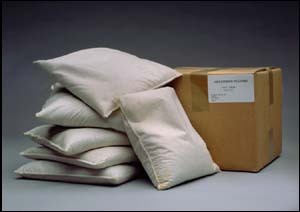 Neutralize and adsorb a hazardous electrolyte spill with a convenient pillow.